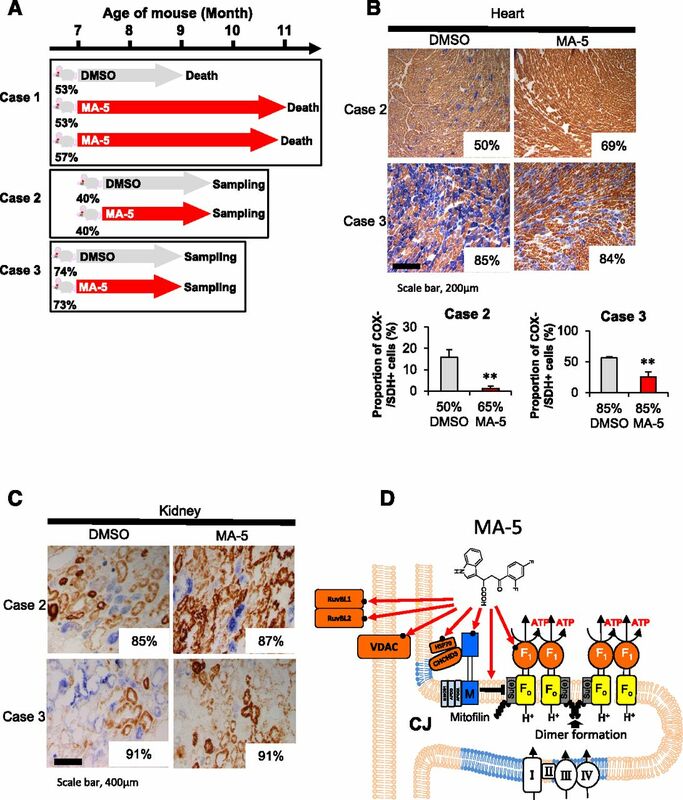 MA-5 rescued the IRI kidney model, and the direct effects of MA-5 on mitochondria are shown. (A) Plasma concentration of MA-5 after oral administration at a dose of 25, 50, or 150 mg/kg (n=3). (B) Plasma creatinine (Cr), KIM-1 immunostaining–positive area, and acute tubular necrosis (ATN) score of kidney histology were significantly reduced in MA-5–treated mice 48 hours after IRI surgery (vehicle [Veh] sham, n=4; Veh IRI, n=5; MA-5 IRI, n=6). KIM-1 stain (×20 and ×100 magnification) and periodic acid–Schiff (PAS) stain (magnification ×200) of the kidney pathology 48 hours after sham or IRI surgery. *P<0.05; **P<0.01 (two-way ANOVA and Tukey post hoc test for plasma Cr, unpaired two–tailed t test for KIM-1 area, and ATN score versus Veh IRI). 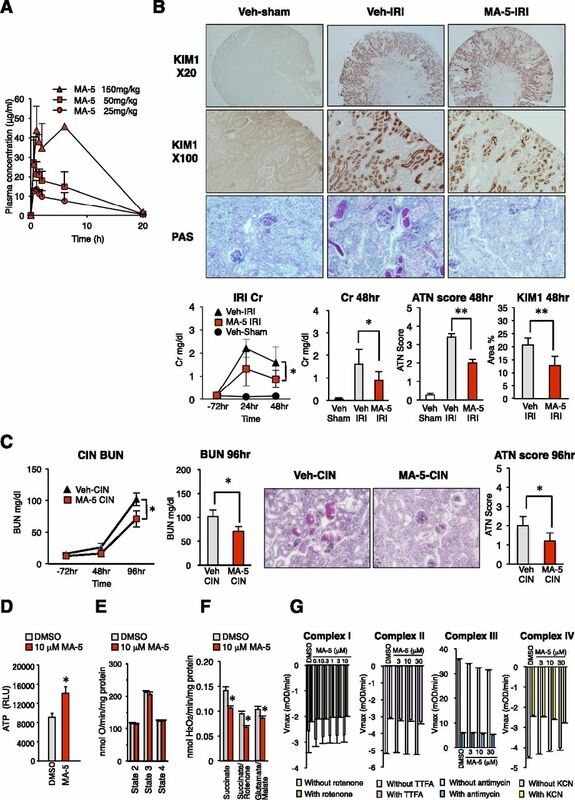 (C) Plasma BUN and ATN score of kidney histology were significantly reduced in the MA-5–treated mice 96 hours after cisplatin administration (vehicle [Veh] -CIN, n=7; MA-5-CIN, n=8). PAS stain (magnification ×200) of the kidney pathology 96 hours after intraperitoneal cisplatin injection. *P<0.05 (two-way ANOVA and Tukey post hoc test for plasma BUN and unpaired two–tailed t test for ATN score versus Veh-CIN). (D) ATP production of isolated detergent–solubilized rat hepatic mitochondria with or without MA-5 (10 μM; n=5). ADP (64 nM) was added to the reaction medium. (E) Respiration rate of mitochondria in states 2–4. (F) Mitochondrial ROS production in mouse cardiac mitochondria was measured with DMSO (0.1%) or MA-5 (10 μM; n=5). (G) Effect of MA-5 on the activities of complexes I–IV using detergent–solubilized bovine heart mitochondria (n=3 for complex I experiment; n=6 for complexes II–IV experiments). *P<0.05 (unpaired two–tailed t test versus DMSO). KCN, potassium cyanide; mOD, milli optical density; RLU, relative luciferase unit; TTFA, 2- thenoyltrifluoroacetone. MA-5 binds mitochondrial inner membrane protein mitofilin. (A) Affinity purification of MA-5–binding proteins using magnetic FG beads conjugated with MA-5. (B) Binding of MA-5 to MINOS proteins. Effect of nonlabeled IAA (50 μM) on 25 nM 3H-IAA binding to RuvBL1 and -2 and CHCHD3 (left panel). Effect of nonlabeled IAA (50 μM) and MA-5 (50 μM) on 25 nM 3H-IAA binding to mitofilin (right panel). (C) LC/MS/MS–based Scatchard plot shows the binding of MA-5 to mitofilin (n=5). (D) The binding kinetics of MA-5 with Mitofilin d1–120 (recombinant mitofilin protein with a deleted transmembrane domain at the N terminus of mitofilin; 121–758 amino acids) measured by SPR. (E) MA-5-BODIPY FL localization in mitochondria (green). Mitochondrial marker Mitotracker Red CMSRos (red) was merged, showing the mitochondrial colocalization (yellow). (F) Colocalized area of BODIPY-MA-5 FL or BODIPY itself with MitoTracker Red CMSRos–stained mitochondrial area (1 nM; n=3). *P<0.05 (unpaired two–tailed t test). (G) Fluorescent intensity of MA-5-BODIPY FL in the mitochondrial region after pretreatment with various concentrations (0.3–30 μM) of MA-5 or IAA (n=3). *P<0.05 (unpaired two–tailed t test versus DMSO). (H) Intracellular ATP measurement of Hep3b cells transfected with a mitofilin expression vector or control vector after administration of 0.1% DMSO vehicle or MA-5 (10 μM). *P<0.05; ***P<0.001 (two-way ANOVA and Tukey post hoc test; n=4). RLU, relative luciferase unit; RU, response unit. MA-5 improved respiration of cardiac and renal cell in Mitomice. (A) Lifespan of Mitomice with the administration of MA-5 at 50 mg/kg body wt per day or vehicle in corn oil (case 1). The percentage of ΔmtDNA4696 in each Mitomouse was determined. (B) Vehicle or MA-5 at 50 mg/kg body wt per day was gavaged for 2 months, and succinate dehydrogenase (SDH) and COX activity were assessed by immunostaining of the heart tissues from Mitomice (cases 2 and 3). Proportion of COX/SDH-positive cells was calculated. **P<0.01 (unpaired two–tailed t test versus vehicle control). (C) Mitochondrial respiration in the kidney tubules. (D) Schematic model of the action of MA-5. MA-5 interacts with mitofilin and modifies the MINOS complex. MA-5 directly binds to mitofilin. 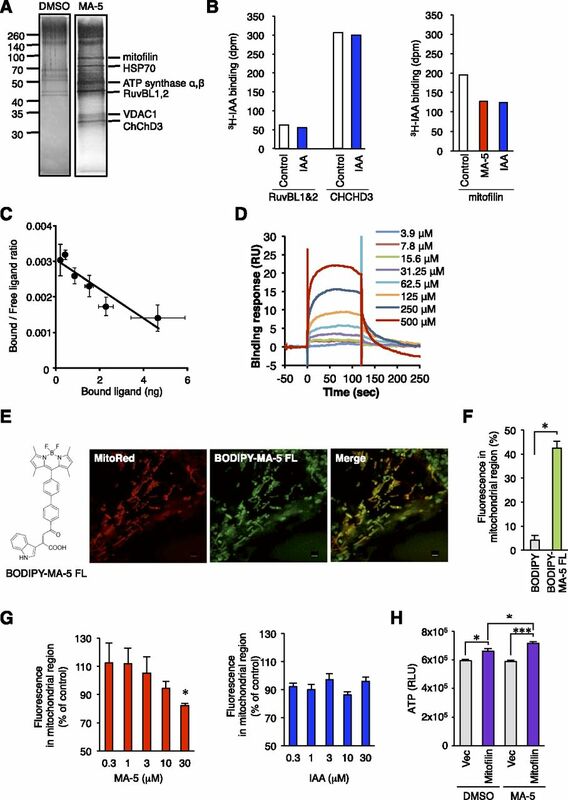 It is reported that mitofilin interact with F1FO ATP synthase,23,24 and MA-5 may also directly or indirectly interact with F1FO-ATPase, RuvBL1/RuvBL2, VDAC, HSP70, and CHDCD3 (all putative interacting molecules with MA-5 are colored in red). Modified from Koob and Reichert13 and Darshi et al.14, with permission. ATPase, ATP synthase; CJ, cristae junction; F1F0, F1 subunit and F0 subunit of ATP synthase.